Cake balls, who doesn’t love them? Perfect for baby showers, birthday parties, your next book club or barbeque, cake balls offer you a sweet little bite-sized treat at the end of a meal. I recently made these for two different occasions. The first was a progressive dinner that ended at my house with after-dinner drinks and desserts. I knew everyone would be stuffed from eating at all the other houses so I offered these cake balls along with some other small cookies. They were a big hit with my guests who liked that they could have a small dessert without feeling like they were overindulging. I also made them for my book club. Typically, everyone has already eaten dinner before my book club so we really have just a few snacks and desserts. Boy, did those ladies ooh and ahh over them. While cake balls are more work than just making a cake, they offer you endless opportunities to be creative with the cake flavor, the frosting, the coating and the embellishments, like sprinkles, jimmies or nonpareils. In this recipe I used yellow cake mix with cream cheese frosting and chocolate for finishing with pastel sprinkles, but you can mix and match flavors to suit your palate. And different holidays offer opportunities to have fun with sprinkle variations. Think red and white for Valentine’s Day, red and green for Christmas, pink and yellow for Easter or pink or blue for a baby shower. Here are a few tips and tricks that will help you achieve cake ball glory. Before you crumble the cake, take a serrated knife and cut off any hard edges or corners of cake. You want the cake balls to have a smooth consistency and these crunchy bits won’t do you any favors. Also, when rolling out the balls, keeps your hands cupped around the cake ball. This leads to a rounder cake ball. After the cake balls are formed, put them in the freezer for about two hours. You can even form the balls on one day, and then finish them the following day. Also, make sure that your chocolate is thin enough. You can add vegetable oil, a tablespoon at a time, until you achieve the right consistency. The chocolate should be runny when you lift it up with a spoon or whisk. Last, you need to work quickly when finishing with the sprinkles. You only have a minute or two until the chocolate starts to set so don’t dally. For finishing, I used pretty pastel sprinkles but you can also use nonpareils or sanding sugar in different colors. Have fun with it! In the bowl of a stand mixer, add cake mix, pudding, eggs, ⅓ cup oil and water. Mix on low speed for two to three minutes, scraping down the sides of the bowl occasionally, until the batter is fully mixed. Grease bottom and sides of 9 x 13 pan. Pour batter into pan and smooth the surface with a spatula. Bake at 350 degrees for approximately 22 to 25 minutes, or until toothpick inserted in the middle comes out clean. Let cake cool completely. Divide in half. Save half of cake for another use. With a serrated knife, remove any hard edges or corners from the cake half. In a large bowl, crumble the cake with your hands until fine crumbs form. You do not want any large chunks of cake. Add ½ cup of frosting. Mix well with a wooden spoon until fully incorporated. Line a baking sheet with parchment paper. Measure out a tablespoon of cake mixture (you can use more or less depending on your desired size). Using your hands and keeping them cupped, roll a cake ball until round and evenly shaped. Place on parchment lined baking sheet. Continue with the rest of the cake mixture until all cake balls are formed. Insert baking sheet into freezer for at least two hours. When cake balls are almost done freezing, prepare the chocolate. In a double boiler, melt two cups of chocolate disks. When chocolate is completely melted, it will likely be too thick. Add vegetable oil a tablespoon at a time, stirring vigorously, until chocolate becomes the desired consistency. It should run smoothly and easily from the spoon in a thin stream. Place frozen cake balls on a plate or in another container. Remove parchment lined baking sheet and three or four cake balls from the freezer (keep the rest in the freezer as it is easier to work with cold cake balls). Have a few tablespoons of sprinkles ready in a small dish. Insert a toothpick into a cake ball. 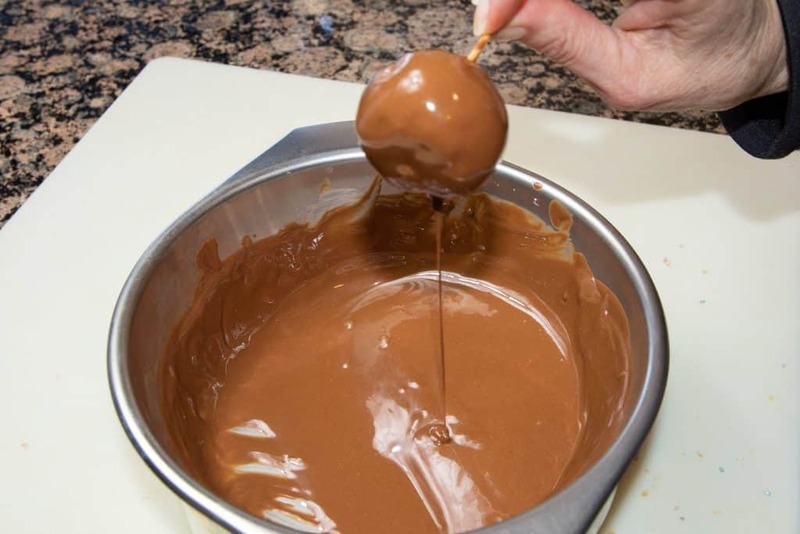 Dip cake ball until completely covered with chocolate, letting excess chocolate drip back into pan. Add a few tablespoons of sprinkles to a small dish. With one hand holding the cake ball on the toothpick, use the other hand to immediately add the sprinkles before the the chocolate sets, turning the toothpick until all of the cake ball is covered. Place cake ball back on parchment lined baking sheet. Remove toothpick carefully after chocolate has set (if there is a little hole, you can fill it in with a toothpick dipped in chocolate). Repeat the process with the remaining cake balls, removing three or four at a time from the freezer.